Can we write about characters who are broken? Can we write about mothers who cannot seem to feed or care for their children? How does such a narrative hold the reader’s attention? After being in The Best Food Ever Book Club for the past three decades, I have heard many dissenting opinions about characters who fill the pages of our selections. There have been passionate arguments about the merits of books, and some have been quick to weigh in on the likeability of those whose thoughts will fill our heads as we read. The protagonist must capture our hearts; if everyone around them leaves little to admire, we will pull for the hero to break free. 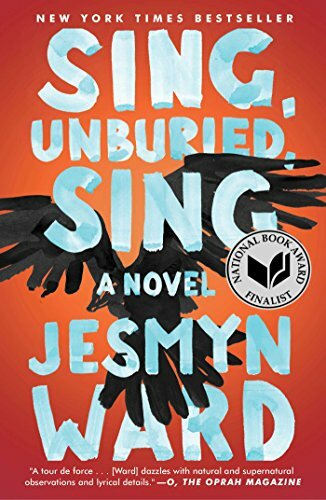 This is how I would describe JoJo, the thirteen-year-old boy on the cusp of manhood in Jesamyn Ward’s, Sing, Unburied, Sing. As the author won the National Book Award for Salvage the Bones and has now gone on to win another, she brings a hefty amount of literary chops to the challenge. In her recent novel, she describes the difficulties before JoJo which seem nearly insurmountable. If anyone reading this is of the age-old belief that we are all born with the same chance in this great country, I would advise reading Jesmyn Ward. Isn’t it the greatest trick, or achievement, to actually change a reader’s philosophy, or understanding of life, by describing a family in the midst of their world and struggles? Will this allow the reader to see how much smooth sailing they may have had in life compared to someone born deep in the swamps of Mississippi whose ancestors were slaves? Through every page of this book, the reader is forced to accept that some families do not need to pull themselves up by the bootstraps because there have not been any boots for generations. How will this end? That is what kept me up at night caught in the grips of this magical tale. The road-trip story has had a place in my heart since reading Jack Kerouac in my teens. If everyone seems to be rolling along, just barely coping, as soon as they get in the car and attempt to go on a journey, our anxiety begins to increase. In the case of Sing, Unburied, Sing, the destination is a prison. JoJo’s white father is about to be released. His white grandfather will not have anything to do with him, but they plan a visit nevertheless. This knowledge increased his fragile identity, and I wished he was able to stay home with his black grandfather who cared for him. With all of the families’ frailties, his dysfunctional mother, Leonie stands out above all others. JoJo’s baby sister clings to him by instinct, and it is our hero who looks out for her. Sometimes, as when in the hands of a skilled author, we yearn for the protagonist to turn out to be a fine upstanding man, but feel the deck is stacked against him. What are the odds? What will have to change in his life for this to happen? Of all the suspenseful situations an author can put her characters in, nothing keeps this reader clutching a book more than a baby who needs to be fed. There is no better way to describe a marginalized society than through the eyes of a hungry child. This book lingered in my mind for weeks. Bits and pieces would come back to me while on walks, or working, or making dinner. It was the mood that would return. There is such a dreamy quality to this work. Ghosts inhabit the characters, as surely as they must remain in those swamps down south. There can never be enough stories of what happened after the slaves were free. Never. When an author can describe the merest remnants of African culture, passed down by the merest of threads, the story begins to inhabit my imagination and dreams. This is the voice of JoJo relating his impression of the roadside stop. Ward is at her lyrical best when she writes in the voice of a ghost. Every family has a story, and every one of them is worth telling. The greatness of the endeavor would have to lie in the chosen word, and in the author’s skill. 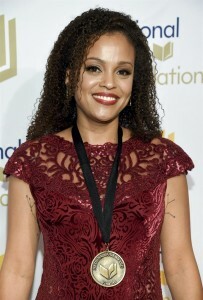 Jesmyn Ward has achieved all of this by winning the National Book Award for the second time. 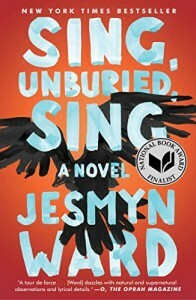 This entry was posted in fiction and tagged Fiction, National Book Award on November 17, 2017 by Elizabeth Smythe Brinton.